Wilfrid Laurier University researchers have worked for decades in Canada’s North, with a particular focus on the Northwest Territories (NWT). Ranging from scientists examining the hydrological and ecological impacts of permafrost thaw to researchers focusing on food sustainability, the critical mass of northern-focused research at Laurier has influenced development of evidence-based environmental policy that has translated into practical applications to support ecological integrity and human health. Permafrost thaw: Laurier researchers are monitoring and evaluating the implications of the rate and pattern of permafrost thaw. Researchers work in a variety of areas, including uneven alpine terrain and areas where lines of trees were clear-cut for seismic exploration, creating lines of permafrost thaw that allow water to be conducted underground year-round. Surface and Subsurface Hydrology: Laurier researchers are monitoring the processes that govern runoff, which are changing in response to permafrost thaw and make it difficult to predict the future availability of water resources. Researchers are working on models in hopes of using these as predictive tools to forecast how the hydrology at research sites may change. Forest ecology: Laurier researchers are monitoring northern boreal forests, which are changing rapidly due to uneven permafrost thaw, as well as sub-Arctic tundra, which is transitioning into taller shrub-dominated communities due to climate warming. Forest fire: Climate warming is known to increase the number of extreme events, including forest fires. However, fire as a natural process is important to maintaining boreal ecosystems. Laurier researchers are working to understand the impacts of increased forest fire activity on vegetation, ground temperatures, snow depth, snowmelt and water quality in high-latitude boreal ecosystems. Greenhouse gases: Areas of muskeg and permafrost both contain vast amounts of carbon in the form of peat. It is not clear how this carbon will interact with the atmosphere as the climate warms. To help answer this question, researchers have been monitoring the flow of carbon dioxide, methane and water vapour between muskeg and the atmosphere. Snow: Snow is highly sensitive to changes in winter precipitation, increasingly frequent winter melt and rain events, warming winters and earlier spring melt events. Researchers are monitoring changes in snow cover and depth at multiple sites. Lakes: Lakes are sensitive to changes in snow and rainfall, evaporation, permafrost thaw and melting of ground ice. It is expected that these changes will result in many shallow lakes drying up. With melting permafrost, catastrophic drainage of these lakes might increase and the very high discharge may present a hazard to people and infrastructure. Stream flows: Changing permafrost, vegetation and snow are affecting stream flow across the North in different ways. Researchers are working to understand the causes and predict future changes. Food security: Researchers are working with communities on aspects of food security and northern food systems including access to traditional foods, fish, game and gardens. Wildlife: Researchers work with wildlife including caribou, whose populations have declined dramatically due to changes in snow pack and forest fire patterns, which has led to changes in migration patterns, feeding habits and vulnerability to predators. A central pillar of Laurier’ northern research initiatives, the longstanding Government of the Northwest Territories (GWNT)-Laurier Partnership is an expanding collaboration between Laurier researchers, the GNWT and a variety of other partners. Formally established in 2010, the 10-year partnership serves to provide new infrastructure and expertise to the GNWT for environmental research and education. The partnership expands the Territories’ capacity to conduct a range of research, inform policy development and to train the next generation of highly qualified personnel needed to manage the territory in the face of emerging challenges. Laurier is involved in a number of other partnerships and collaborative initiatives in the North. These include being one of four partner universities in the University of Saskatchewan-led Global Water Futures (GWF), one of the largest water science collaborations in the world. 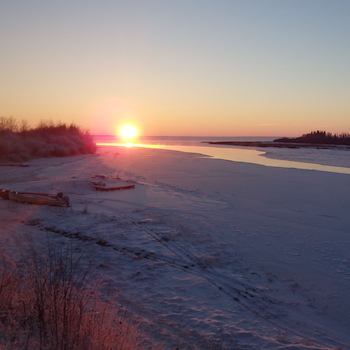 The Laurier-led Northern Water Futures (NWF), a project of GWF, is a Northwest Territories-focused consortium working collaboratively to understand, predict and address the impacts of climate change and industrial expansion on shared water resources across the NWT. Laurier’s northern researchers receive support from diverse funding agencies, including: the Canada First Research Excellence Fund (CFREF), Canada Foundation for Innovation (CFI), the Natural Sciences and Engineering Research Council of Canada (NSERC), the Social Sciences and Humanities Research Council (SSHRC), the GWNT Cumulative Impact Monitoring Program and other funding from the GWNT, ArcticNet, Polar Knowledge Canada, the Polar Continental Shelf Program, and the Northern Student Training Program. Laurier researchers make use of a large range of research sites across northern Canada, primarily in the NWT. In 2015, Laurier’s Changing Arctic Network (CANet) research team was awarded $3.2 million in funding from the Canada Foundation for Innovation (CFI) to enhance its world-class research infrastructure throughout the NWT. In addition to research stations, the infrastructure funding will support 20 “living laboratories,” each representing a widely occurring biophysical environment, plus updates to three environment and natural resources laboratories in the Northwest Territories. For a full list of areas where Laurier researchers work, see Research Sites. It is a high priority for Laurier to ensure communities have a voice in and benefit from the work the university does. Before the university begins projects in any northern community or First Nation, Laurier’s researchers take care to meet with locals and governments to ensure projects are of mutual benefit and are conducted in an environmentally responsible and culturally appropriate manner. Community engagement efforts include field courses for high school students, work with local schools, participation in on-the-land camps to bring together science and traditional knowledge, and public talks to bring Laurier researchers’ knowledge to a wider audience. Wilfrid Laurier University is a leading Canadian university known for academic excellence and a culture that inspires lives of leadership and purpose. With more than 19,000 undergraduate and graduate students, Laurier has a distinct commitment to teaching, research and scholarship combined with a strong student focus, high levels of student satisfaction and a deep sense of community. Laurier’s research strengths address current issues of societal importance, including the environment; governance and policy; health and well-being; culture and society; and economics, markets and management. Laurier has established a reputation for community involvement and engagement. The university’s researchers collaborate with other institutions nationally and internationally as well as with industry, government and community partners. Laurier’s innovation and research-focused faculty are key factors that attract students to Laurier to pursue their research interests.